The President Ram Nath Kovind led the nation in paying homage to Bharat Ratna Baba Saheb Dr. B.R. 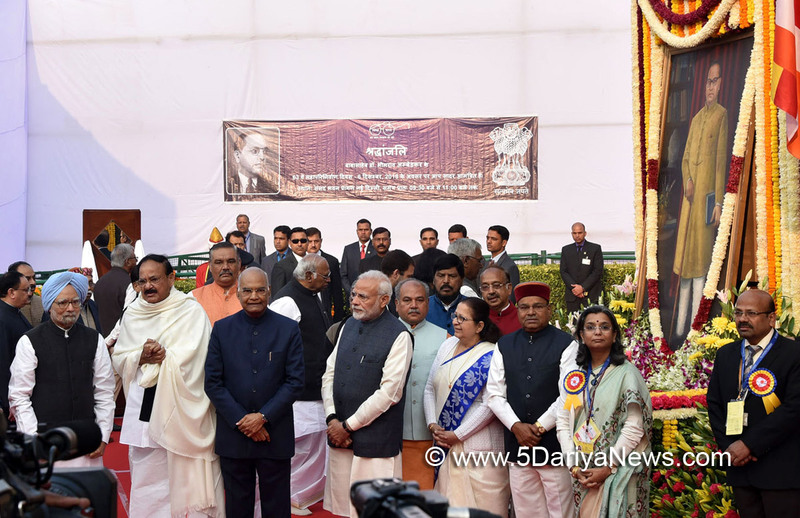 Ambedkar on his 63rd Mahaparinirvan Diwas here today.He offered floral tribute at the statue of Baba Saheb at Sansad Bhavan Lawns in the Parliament House complex this morning.The Vice President M. Venkaiah Naidu, the Prime Minister Shri Narendra Modi and Speaker, Lok Sabha Sumitra Mahajan also offered tribute to the Father of the Indian Constitution, Dr. Ambedkar.Among other leaders who paid floral tribute to Baba Saheb included the Union Minister of Social Justice and Empowerment Dr. Thaawarchand Gehlot, Ministers of State for Social Justice and Empowerment Ramdas Athawale, Krishan Pal Gurjar, Vijay Sampla and other dignitaries.The function was organized by the Ambedkar Foundation, an autonomous organization under the Ministry of Social Justice & Empowerment. Shopian Boy Awarded with "Shaurya Chakra" for Fighting with militants.